Classic bistro style french fries. 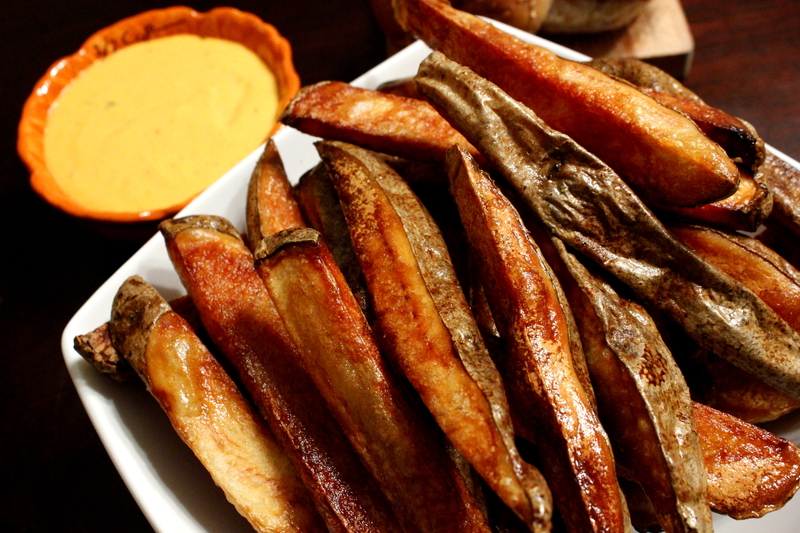 These are great by themselves or with something to dip in like Ketchup or Garlic Aioli. These are one of our staples -- you'll see them make an appearance again. 1. Preheat oven to 250 degrees (F). 2. Cut potatoes into fries. These do best slightly thinner than the ones we made in the photo above. 3. Soak in cool water for 15 minutes to remove some of the starch, this will help achieve the crispy and tender textures desired in a good fry. 4. Dry then roast until just before fork tender, it should take some effort to get the fork to penetrate the flesh. About 35 minutes. 5. Remove fries from oven. Preaheat oil to 365 degrees (F) while the fries cool down. 6. Deep fry until golden brown and the skin is blistered, about 10 to 15 minutes. 7. Remove and allow to dry on paper towels, salt immediately while hot.